A Chinese boxer has died in hospital 42 days after he was knocked out during a free boxing tournament in South China’s Hainan province. Shangguan Pengfei was rushed to a hospital after he collapsed following a blow to the head on Oct 31 during the Kungfu King Free Boxing Championship in Haikou. The death on Monday sparked a wave of public concern over the safety of Chinese boxing, Beijing News and sina.com.cn reports. Some blame the opponent for violating the rules of sportsmanship after the blow to the back of Shangguan’s head, which is forbidden under the rules. Others have questioned how the 23-year-old fighter from Henan province could have passed the organizer’s medical examination given he had already been knocked out in the months before the game in Haikou. According to international rules, any boxer who is knocked out is not allowed to compete in a fight for six months. The umpire of the game has also come under a fire of criticism over his competence as he failed to stop the game. Boxers in the tournament are not required to wear any protective gear despite elbows and kicks being allowed. Moreover, when Shangguan’s family member’s tried to transfer him to a better hospital, the game’s organizer threatened to stop paying their medical expenses as their liability only covers the location where the game is held. 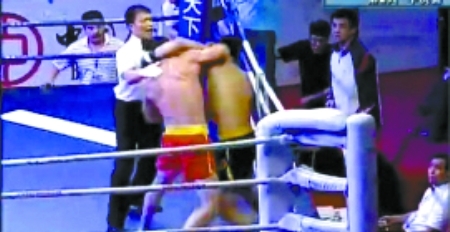 The death has had a profound impact on the Chinese boxing industry. The final match of the Kungfu King Free Boxing Championship has been delayed to next year and a dual boxing meet between Chinese and Indonesian boxers scheduled for Dec 17 has been cancelled.